Your new records can be completely protected from wear damage. Further damage to your previously played records can be stopped. Shock-waves are the primary cause of record wear. Dirt and friction exacerbate the problem. Even new, clean records are subject to shock-wave damage. LAST’s scientists have discovered how you can protect your records from the damage caused by shock-waves, dirt, and friction. The record manufacturing process leaves behind pressing residues and contaminants on the record surface.These sticky residues are tightly bound to the groove wall and attract and hold dirt and debris. Furthermore, they build up on the stylus as the stylus traverses the groove wall creating noise, distortion, and damage from wear. The usual water or water/alcohol mix record cleaner cannot remove these tightly bound contaminants and residues. LAST Power Cleaner is a record cleaner specifically designed to remove pressing residues and contaminants left over from the manufacturing process. Just one cleaning with LAST Power Cleaner results in a record surface that is pristine. Routine maintenance record cleaning prevents abrasion damage that is caused when dirt and debris that have collected on the on the record surface are dragged against the groove wall by the stylus. LAST All Purpose Record Cleaner is is the most advanced everyday record cleaning solution available. It is an economical and highly effective way for general purpose cleaning operations. Or use LAST Record Cleaning Machine (RCM) Fluid with vacuum operated record cleaning machines. QUESTION: Does using LAST All Purpose Record Cleaner or a vacuum system remove the LAST Record Preservative? Briefly, LAST Record Preservative is not soluble in the record cleaning chemistries used in manual, nor in vacuum operated cleaning operations. 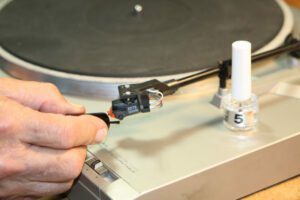 LAST Record Preservative has an extreme affinity for vinyl, and once in place, is very difficult to remove. 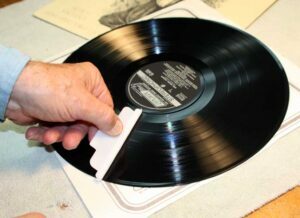 Also, once in place on the surface of the record, there is a diffusion process (aided by passage of the stylus along the groove walls) wherein the treatment penetrates from 10 to 15 molecular layers into the surface of the vinyl until an equilibrium is established. So for standard record cleaning solutions used in either in manual or vacuum machine operation, the integrity of the treatment is not compromised. Once you have a clean record, you can totally protect it from the effects of stylus-caused shock-wave damage by applying LAST Record Preservative. LAST Record Preservative chemically enhances the molecular stability, and therefore the cohesiveness of the groove surface so that it completely resists the effects of stylus shock waves. The 30-second treatment affects the vinyl to a depth of about ten molecular layers and becomes part of the grove wall. There are no surface residues that can be picked up by the stylus. In fact, overuse is harmless. LAST Record Preservative has been universally applauded by the super-critical editors of audio publications. And numerous writers have made the point that LAST Record Preservative produces audible benefits far beyond its original purpose as a preservative. This can be accounted for by the fact that the groove surface integrity achieved by the preservative also provides an improved interface between the indenting stylus tip and the rapidly moving groove walls. According to the editor of International Audio Review, LAST Record Preservative provides an almost 10-dB reduction in high-frequency IM distortion as measured on a test record. Others have reported even greater improvements in overall fidelity from their preservative treated records. A new record that is treated with LAST Record Preservative, kept clean, and not physically abused can be played a minimum of 200 times without discernible wear. A record treated today should be in pristine condition for future generations. A clean stylus protects your record from abrasion damage caused by dirt that has adhered to the stylus tip. LAST Stylus Cleaner chemically cleans the stylus. It removes all accumulated deposits and particles. It is completely safe for all stylus and cartridge assemblies because it contains no alcohol or other components that can damage the stylus suspension. Recommended stylus cleaning frequency: Clean the stylus after the end of playing a succession of records so that you start with a chemically clean stylus the next time you want to play records. Also, clean your stylus anytime you see any visible debris or hear any playback distortion. • Stylus life extension up to 10 times. Stylast is not a lubricant and leaves no residue. It is effective throughout the entire play of one side of an LP record. By following the directions, Stylast cannot be over-applied. Recommended usage: Apply Stylast just prior to every play.